I love your stars, small and big! What size have they ended up at? I think this quilt has such a dramatic feel. The colors look stunning on the black background. 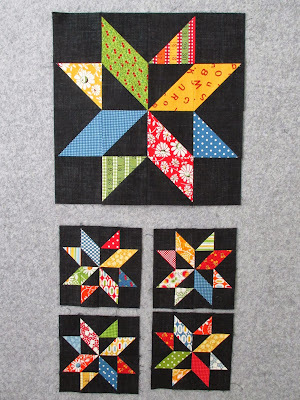 Can't wait to see how you change up that pattern, with your big and small stars! I know you have something cool in mind!!! It's going to be a beautiful quilt, Thelma. Can't wait to see it finished. 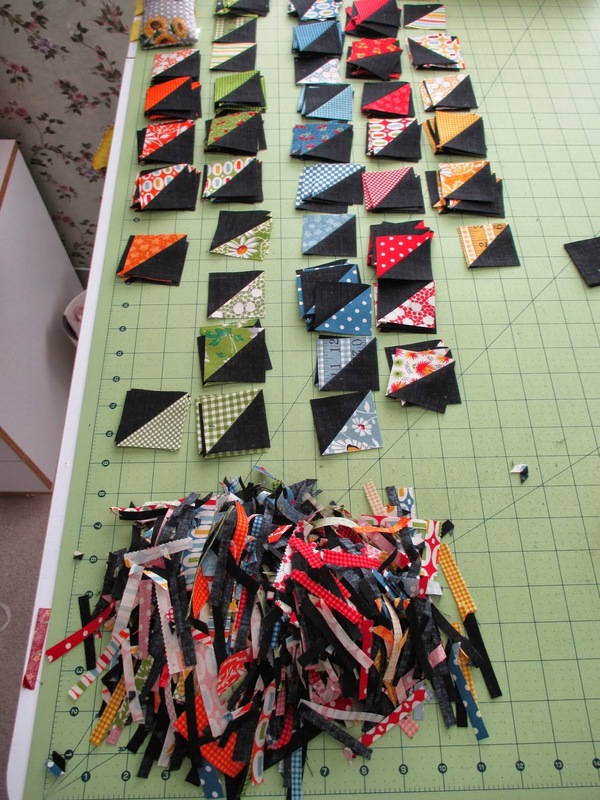 Oh, yes, those colors just pop on the black! O0000h, I am thinking I like that black coffee too! Really like those colors with the black background. perhaps I will think about using black in the near future...Thanks Thelma. Do I ever love the black background! The other fabric colours just pop off the page! I don't believe I've ever used a black background but I sure like it - just like MY coffee, but a tad sweetner. You have plenty of sweet going on here!! And as for the last comment on Fall..... No, I was not ready for fall or winter, it turned pretty cold here also. We are going on a train ride tomorrow though, something we've been wanting to do for a few years. Our color is just turning here so hoping to see some in the higher elevations. Our grandson moved into our FL house, I'm thinking I should give him notice to move.......... I'm thinking I don't want the very long cold winter!!! Dazzling blocks! 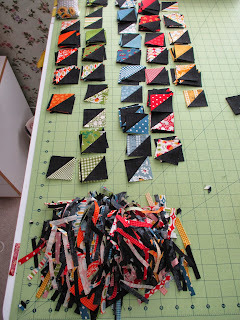 Agree that the only way to enjoy HSTs is to go bigger and trim. So sorry that you are missing fall colors.